Getting certified in pet first aid is one of the best things I’ve done as a pet parent. The knowledge came in real handy that time my hubby and I hiked 6 miles into the woods to camp with Chester and Gretel. Chester got bit by so many mosquitoes that his face swelled like a balloon. After a moment of panic, I was able to gather my thoughts and take control of the situation. Chester scraped his paw on that trip too. It was the first time it had ever happened in all of our years of hiking. I was able to clean it up and decide that he would be fine to walk out if I cut the extra flap of skin off. Pet first aid training also helped me when Gretel ate chocolate. I had her tethered to the seat belt in her car seat and ran into the store for a minute. I had placed my newly purchased, 3 oz. dark chocolate truffle in the back seat where she couldn’t reach it. What I didn’t realize is that the seatbelt can be stretched and extended when the car is not on. And stretch she did… right to my chocolate truffle. I knew to try and induce vomiting with hydrogen peroxide and take her to the emergency vet. After a scary night at home of a racing heart (hers and mine) and muscle spasms (hers), she was ok… thankfully. If I hadn’t been trained in pet first aid, I wouldn’t have been able to pull it together and take action after the initial panic. I wouldn’t have had everything I needed to handle mishaps in my first aid kit. I wouldn’t have felt confident enough to induce vomiting in Gretel to help reduce her toxic reaction to the chocolate. My training has even helped others. After Gretel’s incident with the chocolate, I wrote a blog post about it. A couple of months ago my friend was staying at my house while I was out of town. Her dog ate some chocolate. She remembered my article, looked it up, induced vomiting in her dog (with the hydrogen peroxide I had on hand for situations just like that), and everything turned out OK. 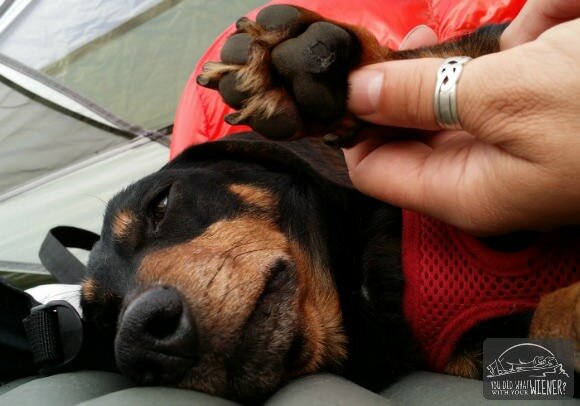 I also know I can help other people if their dog gets injured while hiking or traveling and I share what I know here on this blog. It’s all thanks to my years of pet first aid training. It increases your confidence – Knowledge is power. Once you have been properly trained to handle pet emergencies, you’ll be more likely to feel you can handle anything that might come up. Because your pets deserve the best – You want your pets to have the best care and that starts at home. Knowing how to assess and address an injury or illness between when it happens and when you can get them to a vet can save your pet’s life. You and your pet can be more adventurous – Sometimes adventures take you off the beaten path. Whether you are visiting a tiny seaside town or hiking 5 miles into the woods to camp, you may not always be near a veterinary clinic during open hours or even near one at all. With pet first aid training, you can assist your pet until you can get them expert medical attention. You’ll learn to recognize symptoms before something goes wrong – Being educated about symptoms of shock, hypothermia, dehydration, etc. can help you catch the condition in the early stages before the situation reaches emergency levels. You’ll know how to use what’s in your pet first aid kit – You researched everything that should be in a first aid kit, or bought one specifically for pets, but do you know how to properly splint a broken leg or apply a compress so it will actually help stop the bleeding? The contents of your first aid kit may be useless if you don’t know how to properly apply them to wounds. 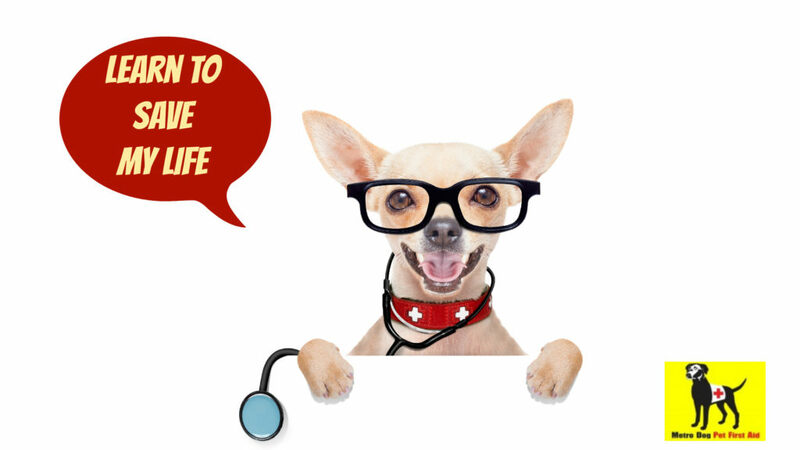 A pet first aid class is the best investment you can make in your pet’s health… and it’s inexpensive – Pet first aid classes are one of the least expensive investments you can make in your pet’s health. For example, the super thorough, one-day pet first aid class offered by Metro Dog in Seattle is $149 and the certification is good for 3 years. That’s only $50 a year, or less than 14 cents a day, for something that might save your pets life or save you money on vet bills. 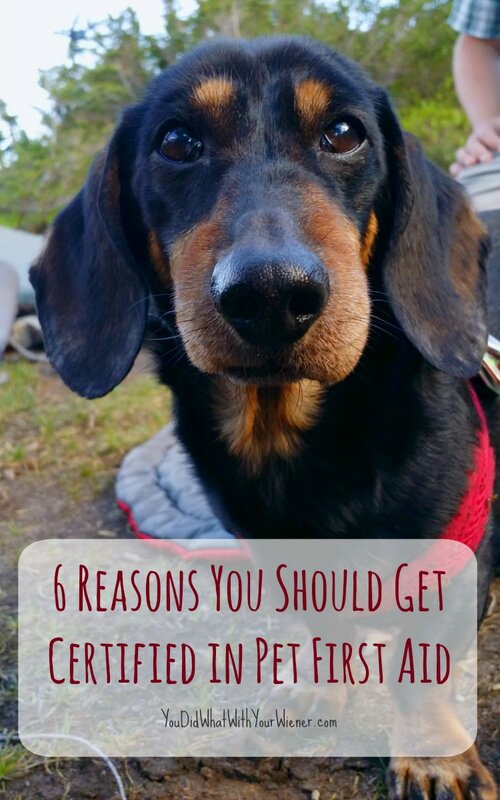 Not only have I used my pet first aid training to help my pets, and those of my friends, but I consider that it may have saved my life too in the case of Chester’s allergic reaction deep in the woods. By the time my Hubby and I got to camp, we were hungry and tired. Our first reaction once we saw Chester’s swelled face was to pack everything up and start hiking quickly back to the trailhead in the dark. I know a bit about search and rescue and I know that heading out into the woods when you can’t see, you are tired and hungry, and you are being pushed by your emotions, is a recipe for disaster. That’s how people get lost and die. My pet first aid training allowed me to take a step back, calmly assess the situation and also know exactly what dose of Benadryl to give Chester. After a bit, the swelling started to go down and he started feeling better. We decided to stay put and everything worked out. Who knows what danger we might have put ourselves in if we had hurried out of there in a panic. Finding a pet first aid class can be a challenge in some areas of the country. There isn’t one offered in some places. In others, someone decided to teach a class but they lost interest and no longer offer them. I’m lucky in Seattle. Pet First Aid Seattle, offered by Metro Dog, has highly-trained instructors and offers regular classes. Their instructors are trained through the nationally-recognized Walks ‘N’ Wags Pet First Aid program. It’s THE most comprehensive pet first aid class you will find in the state and they typically offer classes once a month. I highly recommend this class. The classes are so thorough that the course is the top choice among most pet professionals. The information in the class is great for pet owners who want to be super prepared to handle little emergencies with their own pet too though. This class has received the Animal Wellness Magazine Stamp of Approval and a Modern Dog Fave Find. To sign up for a pet first aid class in Seattle with Metro Dog, or to find out more, email PetFirstAid@MetroDogSeattle.com or call 206-284-3647 (DOGS). You can also sign up to be notified of their upcoming classes here. If you don’t live in Seattle, your best bet is usually to search Google for “Pet First Aid Classes in (insert your town here)”. The Red Cross used to offer super basic pet first aid class but I know they don’t in Seattle anymore. You can always ask your local pet groomer or dog walker where they got their training. Have you ever taken a pet first aid class? Full disclosure: I’ve taken several different pet first aid classes. By far, the one from Metro Dog (the trainers are certified by Walks ‘N’ Wags Pet First Aid out of Vancouver, BC) is the best class I’ve ever taken. I love that class so much that they hired me to help them market the class to the local community. I would have enthusiastically recommended it as THE class to take if you are in the Seattle area whether I helped them with marketing or not. Wonderful advice! Thanks for the class recommendation, too. Do you have any recommendations for classes in Seattle? Hi Danielle. Yes I do. I listed my recommended place in reason #6 but realize it might not have been clear to some. I updated the post so the information is easier to find. I recommend Pet First Aid Seattle, offered by Metro Dog. The instructors are highly-trained and they offer regular classes (typically once a month). Their instructors are trained through the nationally-recognized Walks ‘N’ Wags Pet First Aid program. It’s THE most comprehensive pet first aid class you will find in the state. To sign up for a pet first aid class in Seattle with Metro Dog, or to find out more, email PetFirstAid@MetroDogSeattle.com or call 206-284-3647 (DOGS). Excellent post Jessica. I thought I was well prepared with a few YouTube videos and always carrying my pet first aid kit (that friends and family made fun of) but I hadn’t thought about taking it a step further with a class. I’m going to check into local classes. Thanks! Hi! I shared on my Facebook page and get some requests for Portland based classes, do you have a few in addition to Metro Dog or any that are free of charge to the community in Seattle? I’m going to include on my resource page. Thanks! I really wanted to pin Chester’s picture — see FB group request – hahaha! FB group request? I checked but didn’t see anything from you. Let me know if I need to do something on my end. Chester thinks he’s a pretty big deal and likes to spread his awesomeness around. Ha, ha. I hadn’t figured out yet how to get Dolly’s account to show up it kept wanting to pin to my personal account. My Step Dad recently had heart surgery and he said any squeamishness or modesty issues he had went out the window. Ha, ha. I am sure your Mom can relate. Pet first aid training is important for all pets but especially those entering their golden years. Hope your Mom finds a class she likes. 150% agree. It is absolutely inexpensive and could save a prized member of your family. Good article! Very informative and useful for having my own pets. As I run dog training classes this information will be very useful. Excellent advice, thank you for sharing. Never thought getting certified.